As the least visited continent in the world, Antarctica is an unknown, mysterious place to most people. Although there are dozens of scientific bases on the White Continent, you don’t have to be a scientist to travel to the remote land. Tens of thousands of tourists travel to Antarctica to see its breathtaking views and wildlife. 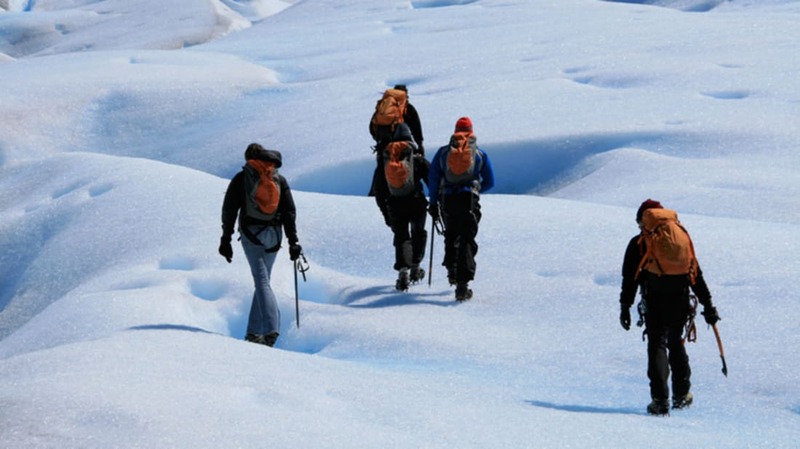 Read on for just a few of the adventures you can have in Antarctica. 1. RUN IN THE ANTARCTIC ICE MARATHON. Each November, runners gather at Union Glacier, Antarctica for the Antarctic Ice Marathon and Half Marathon. Runners endure strong winds and cold temperatures to compete in this race, which is the southernmost marathon on Earth. To prepare for the extreme conditions, some runners exercise on treadmills in walk-in freezers or run on sand. And if you’re up for an even more extreme challenge, the Antarctic 100k (approximately 62 miles) is held each January. 2. GO SNORKELING IN THE SOUTHERN OCEAN. Before you go snorkeling or diving in Antarctica, make sure you’ve got the right gear. Polar snorkelers must receive cold-water certification and wear insulated suits and masks. The water is cold, but the pay-off is incredible. Snorkelers can see icebergs, swimming penguins, shipwrecks, and all kinds of underwater wildlife. 3. KAYAK PAST ICEBERGS AND PENGUINS. While it can be breathtaking to witness the wonders of Antarctica from a ship, kayaking puts you directly in the middle of the action. Kayakers have the chance to see floating icebergs, leopard seals, penguins, and whales up close and personal. Depending on the weather, the water can be rough and choppy, so wait for a calm day to break out the kayak, and bring a waterproof and freeze-proof camera. 4. TAKE A POLAR PLUNGE. Although many ships have a plunge pool onboard, filled with cold ocean water and located next to a hot tub, some visitors in Antarctica make a bold statement by taking a polar plunge directly into the icy ocean. Wearing only their swimsuits, people jump into the water, which is often below freezing, and spend a few seconds in the water before getting out. Polar plungers describe the moment their bodies hit the water as an exhilarating rush of adrenaline. For safety, make sure to be tethered to a boat and warm yourself up gradually after the plunge with warm liquids and blankets. 5. CAMP UNDER THE STARS. Antarctica offers a unique set of challenges—and dangers—to people who want to camp under the stars. Although campers must sleep on the snow in sub-zero weather, they’re not necessarily shivering all night. Campers in Antarctica wear layers of warm clothing and may sleep in a sleeping bag on top of a foam mattress, which provides an extra layer of insulation from the snow. Campers may also sleep in bivy sacs to protect themselves from the wind and cold. Due to Antarctica’s rules aimed at preserving the pristine landscape, campers aren’t allowed to eat, drink anything but water, or go to the bathroom on the land, so be sure you’ve eaten your fill beforehand and packed receptacles for your waste—all of it. 6. TRAVEL IN A SAILBOAT. Most cruise ships that travel to Antarctica offer luxury amenities, but consider traveling in a sailboat for a more extreme mode of transportation. With fewer passengers and a smaller size than a cruise ship, a sailboat built to navigate polar conditions allows travelers to encounter nature up close and experience the silence and stillness of Antarctica. In a sailboat, you’ll feel more like a part of the landscape rather than an interloper. 7. TAKE A VOLCANIC BATH AT DECEPTION ISLAND. At Deception Island, tourists can see a former whaling station—complete with abandoned boilers, rusted boats, and decomposing whale bones—located on an active volcano. As you take a thermal bath in one of the island’s natural hot springs, you’ll probably spot several chinstrap penguins. Just be aware of Deception Island’s volcanic alert scheme, which ranges from green (an eruption is unlikely) to red (a major explosive eruption is expected within 24 hours). 8. GO HIKING AND SLEDDING. The payoff at the mid-point of a steep hike is getting to enjoy the views at the top, and Antarctica’s mountains provide particularly majestic views. As you hike through the snow, you may battle fierce winds and difficult terrain. After you reach the top, you can hike or sled down the slope. For safety, consider wearing snowshoes or hiking boots and using trekking poles. 9. EXPLORE THE SOUTH POLE ICE TUNNELS. Since 1956, scientific researchers have worked at Antarctica’s Amundsen–Scott South Pole Station. Besides housing a runway for aircraft, the station has a network of underground ice tunnels containing the station’s utility lines. Although the temperature in the tunnels is negative 60 degrees Fahrenheit, some researchers have gone underground to create shrines by carving into the ice. As you walk through the tunnels, you might spot a dead fish, a pig’s head, and a sled. Tourists can visit the station, but getting access to the ice tunnels isn’t guaranteed. 10. BRAVE THE DRAKE PASSAGE. As the shortest route by ship to and from Antarctica, the Drake Passage is the body of water between Antarctica and the southernmost part of South America. Known for its danger and unpredictability, the Drake Passage can be extremely turbulent due to its bottleneck position between the Pacific, Southern, and Atlantic Oceans. Unless you fly to and from Antarctica, you’ll probably have to face it. Although not every trip across the Drake Passage is tumultuous, travelers frequently deal with violent waves, strong winds, and changing currents. If you’re up for the extreme nature that is crossing the passage, be sure to take motion sickness medicine and protect your body from plates, bottles, and chairs that might fly towards you when the journey gets rocky.